Mukul Deva completed his education from La Martiniere College, Lucknow, the National Defence Academy, Pune, and the Indian Military Academy, Dehra Dun. Mukul was commissioned in the SIKH LIGHT INFANTRY of the Indian Army in 1981. After retirement, he opened the security service MSD Security which, in the ensuing decade, grew into a dynamic, professionally managed company. With FIVE successive bestsellers in five years Mukul is acknowledged as India’s literary storm trooper and the pioneer of the Indian military action thriller and techno-thriller. Learn more about him here. NAW- Tell us about your book Assassins. What is it about? How did you get the idea for it? ASSASSINS is the second book of the Ravinder Gill series, and as the name suggests it is about an assassin who has been tasked to assassinate two high profile Pakistani leaders while they are visiting India. Though quite a different theme from the first book, WEAPON OF VENGEANCE, I believe it retains the pace and tautness. Also, ASSASSINS deals with the complex dynamics between human beings as they joust to satisfy their egos, and balance their relationships with each other. It also casts a relevant spotlight on Pakistan’s internal situation, its turbulent politics and its tenuous relationship with India. 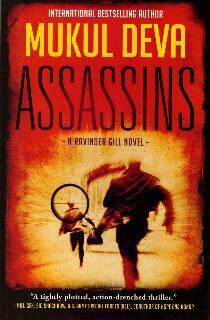 And of course, being a thriller, ASSASSINS has all the requisite ingredients – high decibel killings, intricate assassinations, imaginative weapons, grey characters whom you hate to love and love to hate, high speed chases and the ever escalating tension as super-cop Ravinder Gill and his bete noir Leon Binder, the assassin, race towards their inevitable clash. I will not talk more about the plot since that is adequately covered by the blurb, and advance chapters have been made available online by the publisher; TOR / Macmillan, USA. However, one interesting fact that I would like to share is that the section on Benazir Basheer’s assassination was written by me a few weeks before the assassination of Benazir Bhutto – not the location or the people allegedly responsible, but the manner in which her car was attacked. Then I did not use that section for that book since I thought it would be insensitive. However, I have done so here since it fitted in rather well with the theme of ASSASSINS. NAW- Tell us about the character of Ravinder Gill. How did you get the idea for it? 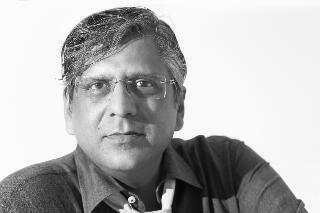 Like all my protagonists in all my books, Ravinder Gill too is a composite of a few people I know and have worked with. Though a good man, with his heart in the right place he is not without his flaws, which is what makes him so interesting. It is also interesting to see how he evolves over these three books; the third book of this series, POUND OF FLESH will release in 2016. I have received some very interesting feedback from the readers, not just about him but also about his daughters, Ruby and Jasmine. NAW- A good thing about Assassins is that it does not portray characters as black or white but most characters are grey versions giving them a more humane persona. This also manages to maintain the suspense till the very end. How difficult is it holding the suspense thread while writing? Do you plan the ending beforehand or do you let the book take its course revising multiple times? Yes, I agree, that unlike the LASHKAR series, where the characters were more sharply etched and clearly either black or white, the characters in ASSASSINS (as well as the first book WEAPON OF VENGEANCE and POUND OF FLESH, the next one) are more complex, certainly flawed and much grayer. That indeed makes them more human and so easier to relate to, and thus the story a lot more interesting and unpredictable. Holding the tension and suspense, especially in the thriller genre, is obviously of paramount importance. And one has to do that while maintaing a tight, rapid pace, hence it is always challenging. That is why I plan every part of the book, from beginning to end before I start writing it. The process is quite similar to building a house; we plan the details and layout first and then start construction. Planning the books also makes it easier to ensure that the primary characters are always facing some tension and threat, which the reader can relate to, and hence stays invested in the story. Planning the layout of the book also ensures that I am able to stick to my (self-imposed) deadline of one book every year. NAW- Your book incorporates many contemporary terrorism themes in your plots. This works very well for the book since it makes it highly relatable but how do you research for your books? Is it easy getting hold of inside information given that much of such info is highly classified? Indeed, research is a very critical compenent of all my books, whether the LASHKAR series or the Ravinder Gill one. You will also notice the detailed impact of my meticulous research in R.I.P and DEATH CAME CALLING – where every single action sequence and murder is thoroughly planned and logically executed. You must realize that my stint in the Indian Army has given me a very close and different view of terrorism. And I continually build on this by spending a lot of time in research, However, as I have mentioned in the disclaimer of every single book I have written I have used only that information which is already in public domain. Also, I must point out that if I am describing a weapon system or bomb or any such thing, I always make it a point to leave some small but critical flaw in it. This is to ensure that it cannot be used by any person with ill-intentions. NAW- How is the market for suspense and thriller novels in your home country? India is such a huge market for books but the thriller genre is largely underrepresented, is it not? Though I now live overseas, but phir bhi dil hai Hindustani. Yes, the thriller market in India is still developing and has a long way to go. Luckily, the Ravinder Gill series is being published in America and available almost everywhere, so it has a much larger presence. NAW- Please name your favourite authors. Are there any you’d like to name as inspiration? Other than myself, my favourites authors (and books) have always been JD Salinger (Raise High the Roof beams Carpenters), Horace McCoy (They Shoot Horses Don’t They), Albert Camus (The Stranger), Bhagwati Charan Verma (Chitralekha), Margaret Mitchell (Gone with the Wind) and of course my huge favourites Shakespeare and P.G. Wodehouse. Each one of them have and continue to inspire me, in the sublime way they use language to communicate such depth of thoughts and the huge canvas they do it on. I am a very simple and ordinary guy. Perhaps the only one thing that differentiates me is my solutions and opportunity focussed attitude, which makes me perpetually upbeat, optimistic and ready to seize the moment. I have a feeling that if they analyse my DNA they would find that the primary component is Carpe Diem. The short version of my life is that I left school (La Martiniere College Lucknow) pretty early, joined the Indian Army, and spent an eventful 16 plus years in it. Leaving the army as a Major I first co-founded MSD SECURITY PVT LTD, which is headquartered in Delhi and operates in about 70 Indian cities. Then I co-founded INFLUENCE SOLUTIONS PTE LTD which is headquartered in Singapore and provides customsied Learning & Development solutions in English, Mandarin, Japanese and Korean to several Fortune 500 companies, MNCs and government organizations across SE Asia. I am also a qualified coach from the Henley Business School UK and a professional mentor. When I am not writing, I focus on the more important thing called Life. As you know, none of us are getting out of here alive so I try to make the most of it. The things that keep me busy are yoga, swimming, reading, movies (all of which I do daily), playing pool, traveling and of course spending time with family and friends. NAW- Can you tell us about your upcoming works? As I have mentioned earlier, my next release is going to be POUND OF FLESH, the third book of the Ravinder Gill series, in 2016. And I am working on another book, which however, I would like to keep under wraps for the moment. Suffice to say, I shall continue to release one book every year, however, the themes shall vary, as will the treatment of each book. I think this should be clear if we look at the past few books – DEATH CAME CALLING, R.I.P and the Ravinder Gill series have their own distinct style and signatures. So, all I can say is, keep a close watch on my website for updates.